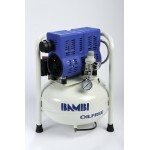 Bambi has used our experiance in nearly 40 Years of manfacturing air compressor to bring you the new PT range of direct drive air compressors. With ultra low noise, from only 54 dB(A) and 100% oil free operation, the PT range delivers a low maintenance solution to ultra-quiet oil free compressed air. Compressors are availible in a choice of receiver and pump formats to ensure that the one chosen is perfectly adaprted to the application. Ideal for Pneumatic Control Systems, Scientific Laboratories, Staple Guns, Picture Framing, Autoclaves, Veterinary Dental Carts, Drink Dispensing, Door Opening, Exhibition Stands ??" and anywhere low maintenance oil-free air is required. 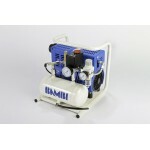 Bambi PT Range compressors are 100% oil free and exceptionally quiet running. 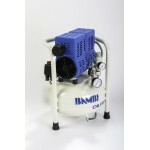 Minimal user maintenance with no oil levels to check and total peace of mind for clean, compressed air. Automatic stop/start operation 6-8 Bar max. 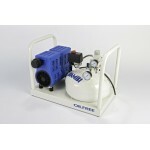 Each compressor is fitted with an adjustable outlet pressure regulator and 10 micron filter as standard. PT compressors have a 65% maximum duty cycle and are not designed for continuous production use. Not designed for dental surgery use.